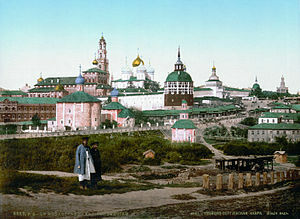 Troitse-Sergieva Lavra in the early 20th century. Boris and Gleb, the first East Slavic saints. An early 14th-century icon from Moscow. Russians sometimes speak of an icon as having been "written," because in the Russian language (unlike English) the word pisat (Russian: писать), meaning "to write", can also be used to mean "to create paintings". Icons are considered to be the Gospel in paint, and therefore careful attention is paid to ensure that the Gospel is faithfully and accurately conveyed. Icons in Orthodoxy must follow traditional standards and are essentially copies; Orthodoxy never developed the artistic reputation of Catholicism or Protestantism, and the names of even the finest icon painters are seldom recognized except by some Eastern Orthodox or art historians. The result of this militant atheism was to transform the Church into a persecuted and martyred Church. In the first five years after the Bolshevik revolution, 28 bishops and 1,200 priests were executed. Between 1945 and 1959 the official organization of the church was greatly expanded, although individual members of the clergy were occasionally arrested and exiled. The number of open churches reached 25,000. By 1957 about 22,000 Russian Orthodox churches had become active. But in 1959 Nikita Khrushchev initiated his own campaign against the Russian Orthodox Church and forced the closure of about 12,000 churches. By 1985 fewer than 7,000 churches remained active. Members of the church hierarchy were jailed or forced out, their places taken by docile clergy, many of whom had ties with the KGB. There is increasing concern in the Orthodox world that the Russian Orthodox Church is separating itself from the other Orthodox Churches. This was emphasised by the events at the meeting in Ravenna in early October 2007, when refusing the compromise unanimously agreed by the other Churches, the representatives of the Russian Orthodox Church walked out of an important meeting with Roman Catholic theologians. The alleged reason for the withrawal of the Russian delegation (headed by Bishop Hilarion Alfeyev) was the presence of representatives from the Autonomous Church of Estonia which is in the jurisdiction of the Ecumenical Patraichate. Moscow claims Estonia to be its own canonical territory, but since Estonia (which the Soviet Union had invaded in the 1940s) had become once again an independent state and has joined the European Union, it is diffcult to understand the basis of Moscow's claim to "canonical territory", unless,of course, it masks a political claim to control an independent sovereign state. Deep concern has also been expressed at the fact that at the same time the Holy Synod of the Russian Orthodox Church has proclaimed St Seraphim of Sarov to be the Patron Saint of Russian Nuclear Forces. In the opinion of many devout Orthodox, it verges on blasphemy to dishnour the memory of the greatest Saint of the Russian Church in this way, as his whole life and teaching was concerned with gentleness and purity of heart in accordance with the Gospel, not military violence or weapons of mass destruction. It shows yet again that the Russian Orthodox Church is turning into a tool of the Russian State. ^ The handover of the icon of Kazan is an historic event. AsiaNews.it (2004-08-26). Retrieved on 2007-06-25. ^ Damick, Andrew S.. Life of the Apostle Andrew. chrysostom.org. Retrieved on 2007-06-25. ^ Voronov, Theodore (2001-10-13). The Baptism of Russia and Its Significance for Today. orthodox.clara.net. Retrieved on 2007-06-25. ^ Российские Вести - Федеральный Еженедельник. rosvesty.ru. Retrieved on 2007-06-26. ^ АРХИЕПИСКОП ИСТРИНСКИЙ АРСЕНИЙ ВОЗГЛАВИЛ В МОСКВЕ ТОРЖЕСТВА ПО СЛУЧАЮ 625-ЛЕТИЯ КУЛИКОВСКОЙ БИТВЫ. pravoslavie.ru. Retrieved on 2007-06-26. ^ Protopriest Yaroslav Belikow. December 11, 2004. The Visit of His Eminence Metropolitan Laurus to the Parishes of Argentina and Venezuela." ^ OrthodoxWiki. ROCOR and OCA. The ** designates a semi-autonomous part of the Russian Orthodox Church. 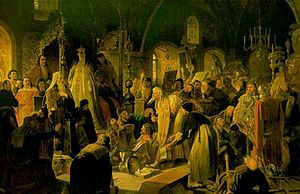 The Russian Orthodox Church traces its roots to the Baptism of Kiev in 988, when Prince Vladimir I officially adopted the religion of the Byzantine Empire as the state religion of the Rus' state. Thereupon the Russian Church became the successor of Constantinople, and the doctrine of Moscow as the Third Rome signifies its position as the spiritual center of The One, Holy, and Apostolic Church of Jesus Christ. The Church was also caught in the crossfire of the Russian Civil War that began later the same year, and many leaders of the Church made the mistake of throwing their support behind what would ultimately turn out to be the losing side (the White movement). The Russian Orthodox Church Outside Russia (Russian Orthodox Church Abroad, ROCA, or ROCOR) is a jurisdiction of Eastern Orthodoxy formed in response against the policy of Bolsheviks with respect to religion in the Soviet Union soon after the Russian Revolution of 1917. On September 13, 1922, Russian Orthodox hierarchs in Serbia met in the town of Sremski Karlovci and established a Synod of Bishops of the Russian Church Abroad, the foundation of ROCOR. In November of 1922, Russian Orthodox in North America held a synod and elected Metropolitan Platon as the primate of an autonomous Russian exarchate in the Americas.